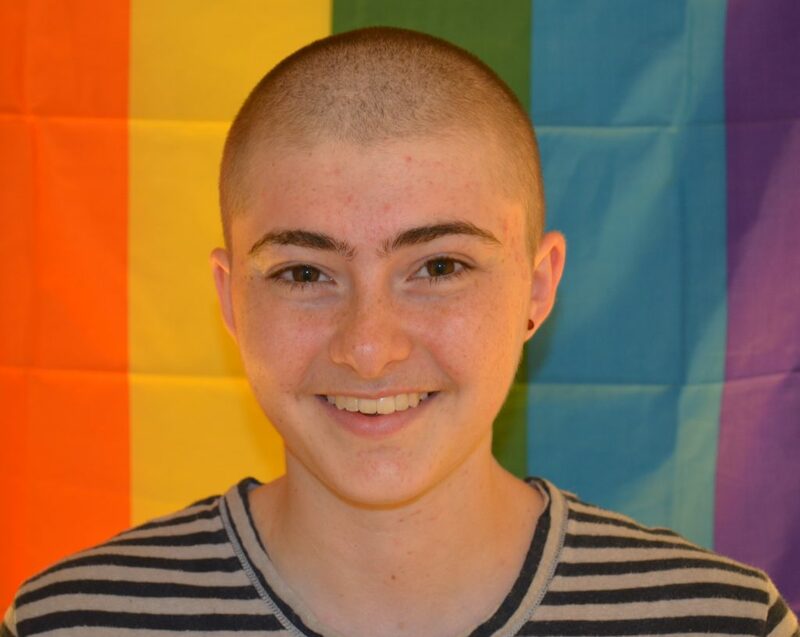 Hallie is a seventeen-year-old Gay-Straight Alliance Network youth leader who attends the Haven Program at Peninsula High School. School has always been difficult for me even in my elementary school years, mainly because of social anxieties. It showed through my horrendous attendance record. By my fifteenth year, I had stopped going to school entirely. That was the same year that my mental health completely disintegrated. The depression became debilitating, and the eating disorder drained my energy. I heard and saw things that no one else could. Being in school was impossible and I missed my entire sophomore year of high school. I asked my mom to fill out papers allowing me to officially drop out when I turned sixteen. Ironically, there was a problem with my paperwork and I was mistakenly referred to another school. That mistake changed my world around, and I’ll be forever grateful that it led me to the place I am now. Now I stay in school because it’s my haven. The teachers, therapists, and students all do an exceptional job in ensuring that my school is an emotionally and physically safe place to be. This kind of safety, along with the academic support I need, allows for me to thrive. I am given the tools to dream and do, with unbridled encouragement all along the way. The students in my new school all have one thing in common: we all have some form of anxiety. To combat the anxious feelings, we start every morning with a yoga session consisting of four or five sun salutations with a couple of balance poses thrown in for good measure. Another way we are taught to manage our anxiety is Over Energy Correction: a type of deep breathing exercise. Some tricks we use are maybe a little less conventional, like blowing bubbles, which also regulates your breathing. One major contributor to my anxiety is leaving the confines of my small separate classroom and going onto the main campus. There, it is not so friendly. I stand out from the crowd and am constantly harassed because of my genderqueer/transgender identity and perceived sexual orientation. For example, no matter which restroom I enter, I am punished by the other students. I’m too masculine to be in the women’s, and too feminine to be in the men’s. I am lucky that my teachers understand and allow me to use the single-stall staff bathrooms, because without that accommodation, I would have no gender-neutral options. The bullying and harassment leaves marks, literally and figuratively. My school’s incredible Gay-Straight Alliance (GSA) club has become one of the few places I feel comfortable enough to share my true thoughts and feelings. The students in the GSA are dedicated to making positive change, and are supportive, protective, and truly interested in each individual and how to make school a safer place for everyone. After our GSA enacted a new anti-slur policy, and did a teacher training on the subject, the amount of hateful language used on campus has dramatically decreased. This was a huge victory for our GSA and for students like me who were being bullied on a daily basis. I consider my school to be my second family, and I couldn’t ask for better relatives. The teachers and therapists are adults that I not only admire, but also wish to emulate. They are my role models, and have been my heroes by introducing me to life-saving resources like the Trevor Lifeline and Gay-Straight Alliance Network. School is a stable force and comforting routine in my life. If it weren’t for the support that I receive at school, I wouldn’t be here today. I stay in school because it’s the place I crave to be when I am homesick, or lonely, or both; because there is no place on earth that is safer; and finally, because our Uno games get pretty intense. We have fun, and that’s important.